Healthy, Delicious, Quick, Easy PIZZA! YUM! HomeNutritionRecipesHealthy, Delicious, Quick, Easy PIZZA! YUM! December 5, 2010 No Comments on Healthy, Delicious, Quick, Easy PIZZA! YUM! It’s no secret that Americans love their pizza; the average American will have eaten 23 lbs or around 46 slices of it this year! That can mean some serious damage to waistlines, blood pressures, and hearts, but it doesn’t have to be this way. You can have your pizza and eat it too! I’m a firm believer that you don’t have to swear off popular comfort foods in order to lose weight or maintain your health, you just need to degunk them a bit. I love pizza just as much as anybody, but I do not love the nutrition facts that generally come with a grease-stained box of delivery. According to the company website, an Italian sausage personal pan pizza from Pizza Hut contains 720 calories and 36 grams of fat, 14 of which are saturated, and 1 gram is ultra horrendous trans-fat. Now don’t think that it’s only the sausage doing all the contributing to those facts either, a plain cheese personal pan pizza still weighs in at nearly 600 calories and 24 grams of fat, 14 of which are saturated, 0.5 grams of trans-fat. My healthy pita pizza to the rescue! As I said before, I really do like pizza, and sometimes I’ll even make dough from scratch so I can experiment with different whole grain flours like rye and buckwheat in addition to whole wheat. But that requires time and planning, which sometimes even I can’t manage. So, in times when I’m craving pizza but don’t feel inspired enough to do it all by hand, I DO NOT pick up the phone! Instead, I pick up a bag of whole wheat pita bread (make sure it’s really 100% whole wheat! ), spread some toppings and pop it into a 400 degree oven for about 8-12 minutes. That’s it! And, perhaps most importantly, not only is this pizza healthy, it is super delicious! 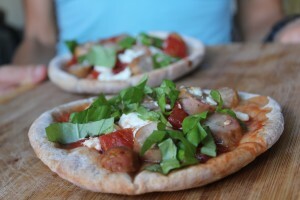 These basil, feta, chicken sausage pizzas each came in right under 300 calories, with only 8.5 grams of fat, 5 amazing grams of fiber, 17.5 grams of hunger stomping protein, and only 39 grams of carbs. If you wanted to lower the calorie and fat count even lower, you could try topping your pita pizza with a leaner protein (maybe shrimp, chicken breast, or even edamame) and omitting the cheese. I always advise people to go with a stronger tasting cheese (not just for pizzas, but anything you make that you really want some cheese on) because you can get away with using a lot less of it without feeling like you’re depriving yourself. Think about a bag of shredded mozzarella. How flavorful is that? Compare that to a small slice of goat cheese, brie, or blue. You want to go for taste and quality NOT quantity. The fact that I use whole wheat pitas also boots this pizza’s nutritional value; the fiber and protein in the pita itself will help keep you full (so you’ll be satisfied with less) and will not wreak the havoc on your blood sugar that white dough does. That type of dough also tends to stick in your intestines and cause all sorts of distress, which besides being uncomfortable and potentially embarrassing, can also contribute to bulging out the area right below your belly button. A final thought for you. If you were to swap out your 23lbs a year of takeout pizza with my pita pizzas, you would lose roughly 5 lbs! How do I know this? A pound of fat is 3500 calories and the difference between a year’s supply of my pizza versus that standard takeout is a bit over 17,500 calories. The math is clearly in my favor! What other “diet disaster” foods have you cleaned up so that you can still enjoy them on a regular basis?